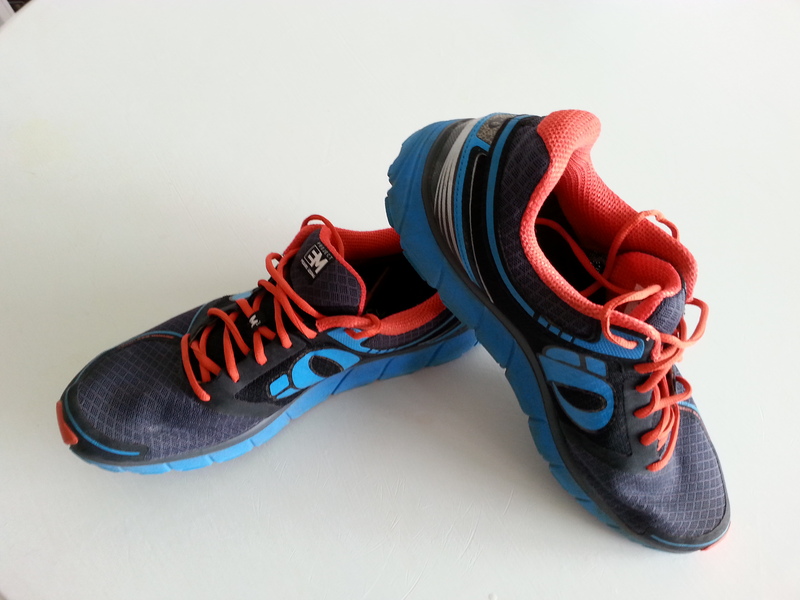 First, a confession: what first attracted me to these shoes wasn’t the seamless, breathable upper (perfect for keeping the tootsies cool and blister-free), thick cushioning or decent arch (ideal for my moderate over-pronation); it was their colour. Others have called Pearl Izumi’s rather lurid colour schemes obnoxious and gaudy, but there was nothing I wanted more than to be rocking these little black/electric blue/florescent orange numbers on my evening runs. Of course they deliver more than mere street cred (or crud, depending on your viewpoint). As my first pair of trainers after a disastrous experiment with Vivo Barefoot (resulting in a bruised heel and a succession of injuries down my left side… I’ll write about this soon), my main priority was a sole that offered adequate cushioning, but didn’t feel heavy and ungainly. The M3s delivered on both counts. Stacked to 25mm at the heel, there can be doubt about the support this shoe offers, yet they avoid that bouncy, running on trampolines feeling you can get with some mid to high support shoes (my first pair of Brooks a few years ago fell into this category). They feel light and absorbent while giving me confidence whatever the surface. I’ve had no problem with them on trails, no matter how wet (although I’d probably opt for something with more support and grip for more challenging trails). They wick moisture away from your feet almost immediately and the breathable material of the upper shoe keep your feet feeling cool. Now, I don’t know how these would fare on longer distances (over the next few months I’ll be finding out), but for the runs of no more than eight miles I’ve been able to take over the past injury-plagued year, the M3s have been perfect. There’s no tongue slippage (something I often get, for some reason, on my left foot), no blisters and my feet have stayed cool and cushioned.